Relocating your place of business can be made quick, easy and cost effective with our specialised business relocation in London. Our commercial removal solutions are specially designed to wrap around your needs and budget requirements. 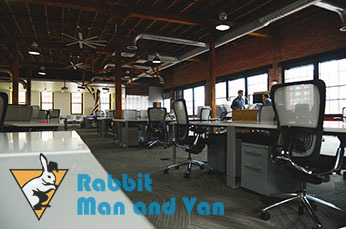 We will have your office, shop or establishment moved in the shortest time possible, and with minimum hassles. We understand that commercial removals can be time consuming exercises and so in order to minimise business downtime and save you lost profits, we organise and carry out all stages of the project from start to end. 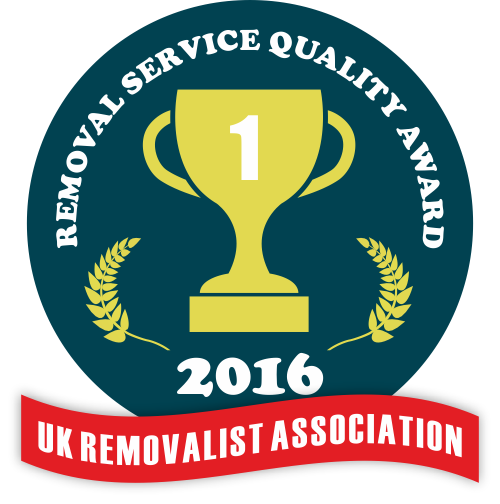 The removal itself will be conducted in a suitable time and day of the week with minimum hassles and no unnecessary delays. 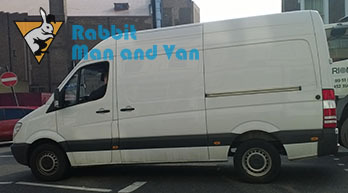 Since Rabbit Man And Van London is looking to provide our business clients with a seamless moving experience, and save any extra fuss and excess cost, we aim to cover the entire range of requirements which usually go hand in hand with man and van removals in London. We can visit you for a preliminary viewing and onsite quotations, this will not only help us offer you the best possible price, but also ensures the removal itself is planned and carried out in the most suitable and efficient manner. We are able to deal with disassembly/reassembly of office furniture and other equipment which is best handled and transported in pieces. We can do the packing, securing of items and equipment, as well as the labelling/listing or colour coding of boxes, crates or identical filing cabinets. If the project at hand is of substantial proportions, we can arrange for more than one vehicle to be engaged in the removal and keep the job within reasonable time limits. As expected, our business relocation in London is a customisable solution designed to cover specific client needs so we can include additional services like office or establishment cleaning, property clearances as well as cost effective business storage options. In order to ensure efficient and error-free business removal services, we employ skilled and experienced removal technicians and professional drivers. Our teams will handle their duties with professional precision and efficiency without risking damage to equipment or allowing for any costly delays. Should there be any special requirements, please make sure to inform our teams upon arrival and they will address those accordingly. The removal process will be carried out and completed in the most unobtrusive and diligent fashion as to prevent disruption to any other property occupants, should there be any. We recommend booking your business removal for an off peak time of the week in order to keep service time to minimum and avoid any traffic delays. Office removals in London can be booked for all days of the week, including Sundays and public holidays under flexible hours. For any specific information or details on pricing and additional options, please contact our customer consultants via phone or email. London is one of the financial and business capitals of the world. Office and retail space in the city, and not just Central London, has been growing and expanding in the last decade. New office complexes and commercial and retail centres are popping up across many areas, including many parts of East London. Traditional office complex clusters in Central London are tenanted for decades to come, so if you are looking to establish or relocate your business to London, by all means take a look at the newly constructed commercial and office complexes outside The City. The opportunities there are just as business-friendly and could actually save you some money on office rent.